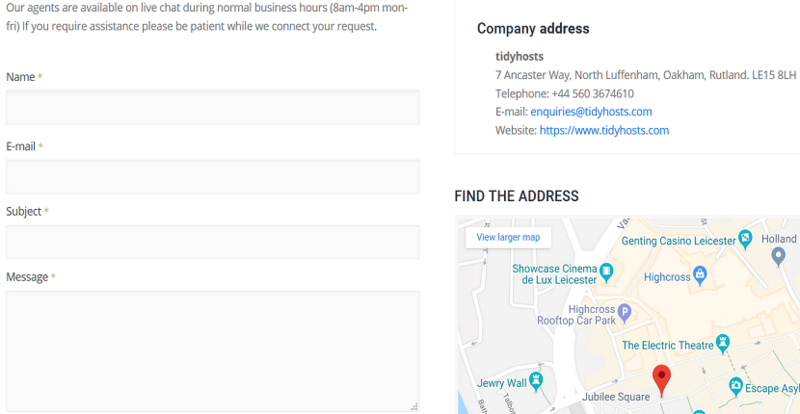 tidyhosts Review 2019: Is tidyhosts a Good Hosting? tidyhosts is a U.K. based cloud hosting vendor that has been in operation since 2004, offering services in domain registration, shared web hosting, hosted exchange email, media streaming, WordPress hosting, and cloud virtual servers. Established in 2004, tidyhosts has servers located in the United Kingdom hosting over two hundred thousand websites. It offers shared web hosting and WordPress hosting among other options, and all of its services are provided entirely in English. Its shared web hosting has three plans with the most basic one coming with a minimum of 1GB storage, 10 databases, unlimited subdomains, five email accounts, a 30-day money-back guarantee and a control panel. This isn’t so bad for a start, given that it allows for upgrades as you grow and require more resources. For the control panel, you can choose between cPanel and Plesk for Linux and Windows respectively. 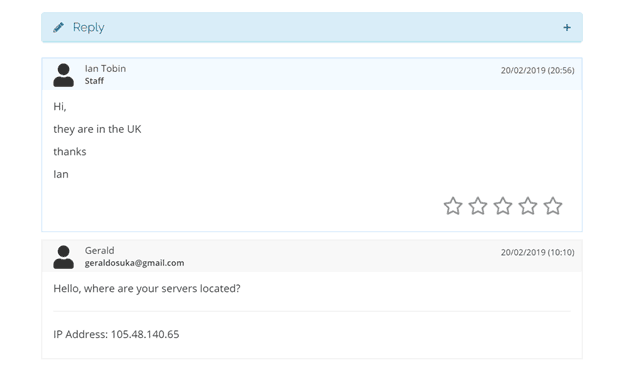 The two also feature FTP accounts, backup control, email management, domain management, app installation, MySQL and/or MSSQL databases, and add-on domains. The two control panels are widely known for their ease-of-use and non-techies will have an easy time managing their various websites here. The website builder includes the use of Soholaunch for creating websites and Opencart for managing and creating online stores. These two are installable apps and also completely beginner-friendly. They have numerous customizable designs and all you have to do is make your choice. You can simply update and change anything on the website without necessarily coding. The todyhosts cloud VPS hosting gives you a wide variety of options to choose from with storage ranging from 40GB to 120GB along with the same 30-day money-back guarantee. It also includes SSH access and SSL certificates. The cloud server is very powerful and easy to use, in addition to also being flexible. The servers perform very well and once you set them up, they start working within a fraction of a minute. tidyhosts offers a range of pricing for its services that can accommodate almost anyone. Comparatively, its shared web hosting plans are much cheaper compared to its main competitors in the region. However, there is no uptime guarantee available with its services. The web host start plan (entry-level) is very cheap considering the storage space provided but there is a catch. Unlike the other plans, if you choose to buy this one you will have to pay for your domain every year. Payment for tidyhosts services can be done via PayPal or credit card payments, and you can choose to make either monthly or yearly payments. If you purchase and are not content with the service, the company offers a thirty-day money-back guarantee. This way you can ensure that no losses are incurred from trying out its offerings. The current communication channels for the company include phone, live chat, tickets, and email support. I took the opportunity of communicating with its experts via the ticketing system to inquire about PHP support but I was left disappointed. The customer support is poor as it takes a long time to receive an answer, if one is received at all. There is also a live chat options displayed but I have never seen it working. All in all, the advertised 24×7/365 support appears to be just for show. tidyhosts is a high performing cloud hosting vendor offering very powerful and quality hosting services, except for support, and at very affordable costs. Buy affordable and powerful hosting with tidyhosts! 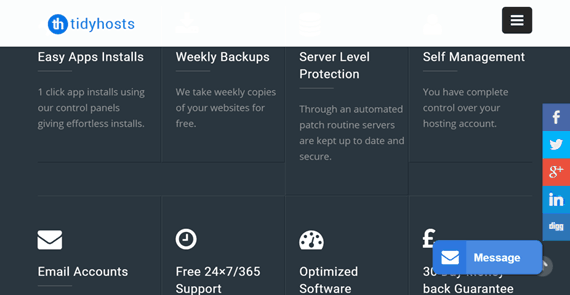 Wondering how tidyhosts stacks up against other Web Hosting companies? Enter any other Web Hosting company and we will give you a side-by-side comparison.